Find artworks, auction results, sale prices and pictures of Keisen Tomita at auctions worldwide. 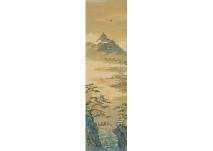 Tomita Keisen was one of the major artists of Kyoto in the early20th century. His unconventional style has roots in classicaltraditions. 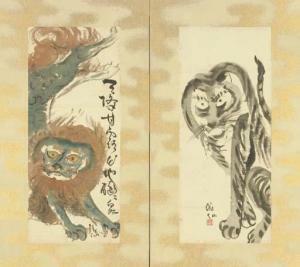 Here he combines the exuberant drawing found in Nangaand Shijo paintings in a palette derived from Yamato-e andRinpa. For other works see Michiyo Morioka and Paul Berry, Modern Mastersof Kyoto: The Transformation of Japanese Painting Traditions,Nihonga from the Griffith and Patricia Way Collection, exh. cat. (Seattle: Seattle Art Museum, 1999), pp. 176-85. Mt. Horai TOMITA Keisen ink and color on silk, 131.2x36cm, signed and sealed, mounted for scroll.with an authenticity certificate by Tokyo Bijutsu Club. with a wooden box signed by the artist. 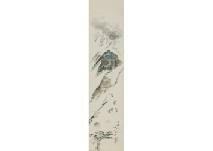 Snow in northern Japan alps TOMITA Keisen ink and color on paper, 146.1x34.3cm, signed and sealed, mounted for scroll, with a wooden box signed by TOMITA Yoshiko. 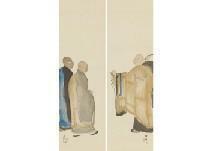 Nansen kills the cat (a pair of scrolls) TOMITA Keisen ink and color on silk, each size 114.3x35cm, both are signed and sealed, each mounted for scroll, with a wooden box signed by the artist. 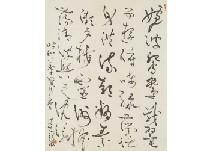 Calligraphy(poem) TOMITA Keisen 1933, ink on paper, 103.9x85cm, signed and sealed, mounted for scroll, with a wood box signed by IKEDA Yoson.